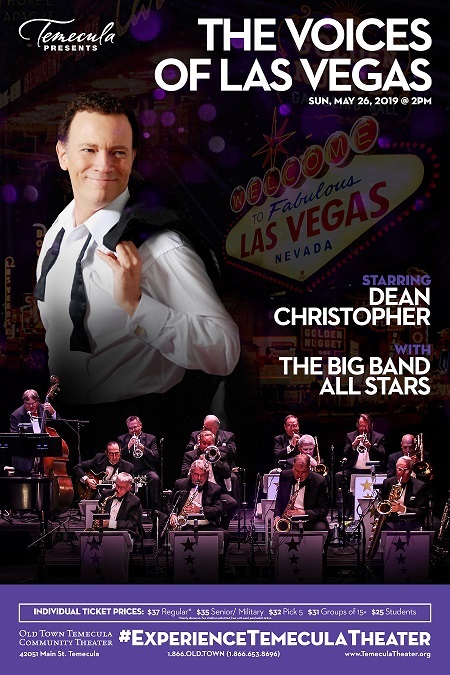 The Voices of Las Vegas starring Dean Christopher and the Big Band All Stars will simply entertain. Great classic entertainers from the top casino show rooms in Las Vegas all come alive under the arrangements of the Big Band All Stars. Return to Las Vegas in its heyday without laser lights, pyrotechnics, back up dancers, or multiple costume changes. An accomplished singer from St. Louis, Dean pays tribute to influential performers with impressions of Tom Jones, Elvis, Dean Martin, Johnny Mathis, Frank Sinatra, and Sammy Davis Jr.
*Family Discount: Two children admitted free with each paid adult ticket.